Over at GapingVoid Hugh is talking about his blue monster project. 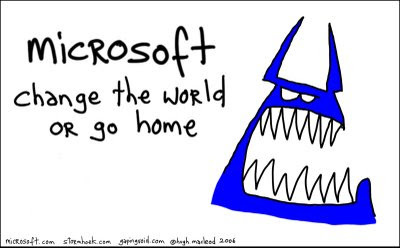 An interesting initiative for Microsoft which says, as you can see, 'Change the world or go home'. That's what we all try to do. I do at least. Whether through bold schemes like 365films, Circumference - or by changing how we view our work with The Scriptwriters Life - or by working on adventurous and challenging spec scripts like the 'medieval western', the Kiss of Judas. We all do that as writers and film makers I believe. We all want to say something that matters, that makes a difference. I also think it is okay if you go home instead. Sometimes you can't change the world. Going home is okay. It is where my long-suffering wife is for a start! In fact not enough people 'go home'. This video I directed a while back is about just that. Caroline Bannock was the youngest ever associate producer for ABC News. She talks about the ultimate work pressure, working in a war zone to tight broadcast deadlines – and how she now has achieved a better balance in her life. She is now a scriptwriter by the way! "Change yourself like you'd change the world"
Christmas gifts for film nerds aka "Get shorties"